As a second installment to the series The Race to Halalan 2016, this article will discuss the meaning and origins of the family names of the 2016 presidential aspirants. It is interesting that they are as different as black and white even with just the origin of the last name of the presidential candidates. Vice President Jejomar Binay's last name, for instance, is Filipino in origin, specifically Tagalog. Senator Grace Poe's last name (albeit her adopted last name, as her birth surname is currently unknown) is of Spanish origin, specifically Catalan, and not American or English as many think it is. Two other Spanish surnames are Senator Miriam Defensor-Santiago's and Secretary Mar Roxas's. The latest to join the race, Mayor Rodrigo R. Duterte, has a surname with French origin. What is interesting also among these 5 surnames is that it is clear that all 5 are pre-Claveria decree family names; that is, even before Filipinos were forced to adopt a legal family name these family names were already existing. Grace Poe's last name, though American sounding, was originally spelled Pou by her adoptive great-grandfather (FPJ's grandfather), Lorenzo Pou, is directly inherited from him. Lorenzo Pou, originally from Majorca, Spain, brought the surname to the Philippines. This was later bastardized into Poe, which remains as such today. The Roxas family name is also an old surname, which can be traced as far back as the 1700s in the Philippines, and to the 1600s in Mexico, then Spain. It was originally spelled Rojas and today both surnames appear in both forms. Duterte's last name, as discussed in an earlier article, was spelled du tertre, indicating a French origin. It has been in usage in the Philippines as late as the mid-1700s, again another last name that is clearly not taken from the Claveria decree. Binay's and Defensor-Santiago's family names are the same forms as they were in the past. The Defensor last name appears in pre-1849 records in Iloilo and like many last names in Iloilo appear to be old, pre-Claveria decree. 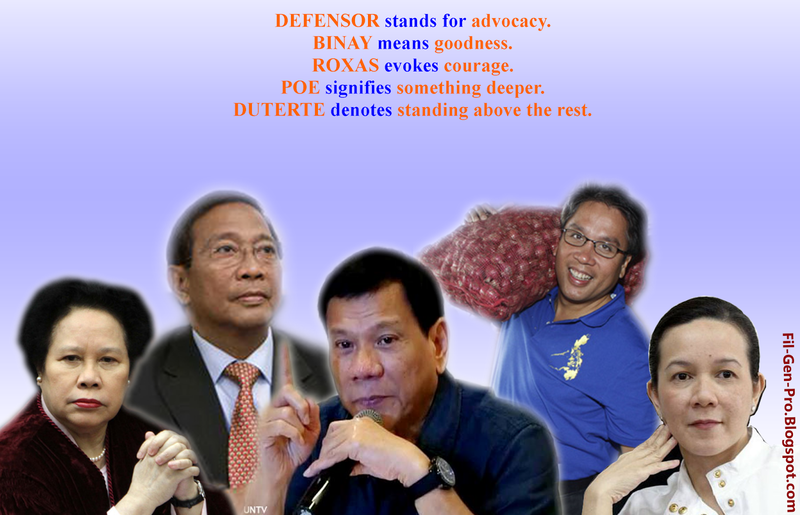 Binay's is the only last name that needs further research, though in its current form it appears to be of indigenous origin and could very well have been used before 1849.
Who would have thought that Vice President Binay, who has been hounded by case after case of corruption, has a last name that means "goodness" or "kindness"? Or that Grace Poe's last name, in its original form, means "well" or "pool", which could allude to something deep, clearly an allusion to the saying "silent water runs deep". Senator Santiago's maiden name, Defensor, evokes her stand to defend the constitution and the rule of law all the time, making her an "advocate", a "defender". Roxas's last name means "red", though while it may jokingly indicate Secretary Roxas going red in the face and still not winning the presidency, the color red also signifies "courage", "auspiciousness", and "freedom" according to the Romans, Chinese, and the French during the French Revolution. Duterte's last name means "hillock" or a "small mound", but is also an allusion to "rising above others" or "prominence" or "elevation" (clearly, hours after announcing his presidential bid, he has surged to the top of election surveys). Clearly, one can get quite a lot of "feel" from the surname of the presidential candidates. Hi Todd! Thanks for sharing your research about Filipino genealogy. My parents' surnames are pre-Claveria decree. Araña- Villablanca from my mom and Justimbaste-Tibe from my dad. Can you recommend any docs or manuscripts about Leyte families. I also wanted to do research about my ancestors' families. Thanks!